Brooks's marketing pitch: Perfect balance of support and soft cushion. 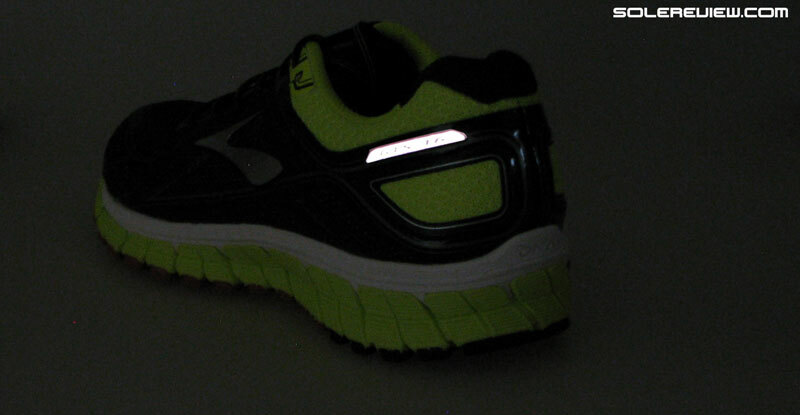 Upper: Mesh, fused-on urethane and synthetic leather. 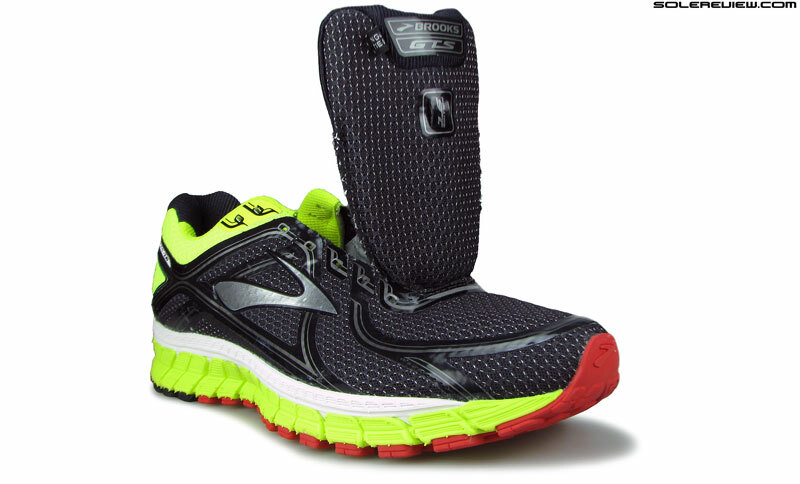 Midsole: Quad density compression molded EVA foam, plastic midfoot half-shank. 12 mm heel drop. Outsole: Soft blown rubber under forefoot, carbon rubber under heel. Widths available: B - narrow, D - regular (reviewed), 2E- wide, 4E - extra wide. If you want a running shoe with a firm and supportive ride, the Adrenaline GTS 16 provides that without any drama. On an overall scale, the GTS 16 is similar to the 15, except for a shallow toe-box and a few other minor changes. Here’s another shoe review. And how does solereview go about its business exactly? One of the things that solereview does during the making of a review is to run in both the current and the previous editions of a shoe. This allows us to ferret out the differences between the two, allowing for the creation of cool stuff such as match scorecards (like the one at the bottom of this review) and a general commentary on what has improved (or not). For instance, if the test mileage for a day is 10K, then that would be split into 3K on the latest model, followed by a 4K on the previous version, and then a 3K switch back on the latest model. This process yields one of the two outcomes. Either major differences in the upper fit and ride quality between the two will become apparent, or there are near-to-none updates. The first result is more desirable for a reviewer, because it’s more fun (and easier) to write a review when there is plenty of material to tap into. The second outcome makes the review a bit harder for obvious reasons. 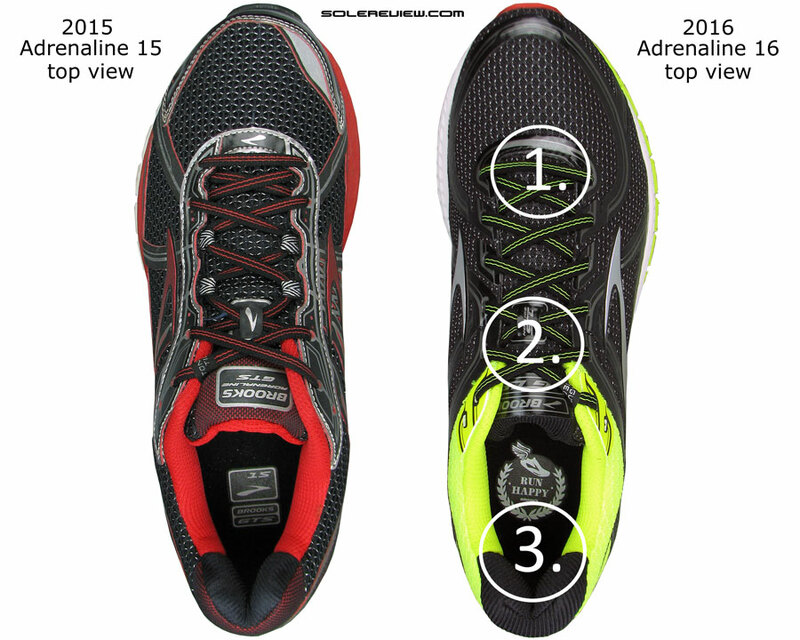 The second outcome applies to today’s review of the Brooks Adrenaline GTS 16. The 16 is very similar to the 15, so for those who are looking to upgrade, our suggestion is to buy a pair of the GTS 15 for a generous discount over its full price. You’ll end up saving $$, which is always a thing of fleeting joy. For everyone else who wants to get to know the Adrenaline GTS 16 better before parting with their money, then what follows next should be a good place to start. 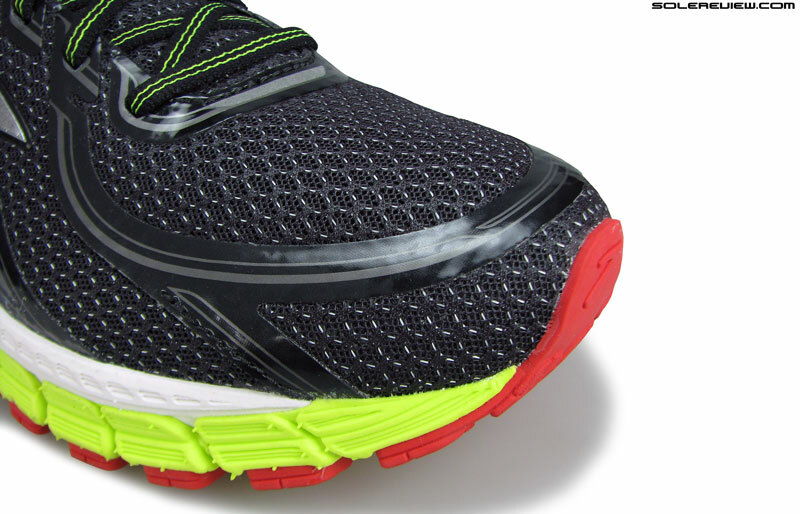 The 2015 Adrenaline GTS 15 was the result of Brook’s misguided and unfortunate switch from the Gel based DNA to a pure foam based cushioning platform. Say what you will, but none of the models based on the new BioMogo-DNA-whatever foam are impressive. Decidedly, Brooks builds visually appealing shoes which are good to run in; and the design effort invested with respect to the upper and midsole construction is apparent. But as far as the ride quality is concerned, it has some catching-up to do. The Adrenaline GTS has been one of Brooks’s staple for sometime now. After all, the suffix ’16’ in the model name stands for the number of times the shoe has been reincarnated over the years. Within the Seattle based brand’s running shoe assortment, the Adrenaline is positioned as a ‘support’ shoe, the kind of shoe which is supposed to control the inward rolling of the foot. But if you have been following our reviews, you know perfectly well what solereview thinks of this paradigm. Our opinion is that a person’s arch height or gait mechanics should not automatically warrant a ‘stability’ shoe. This approach might work, and it might not depending on the individual, and the same applies for ‘neutral’ shoes. Luckily, the industry is warming up to the idea of not generalising runners; the Brooks Transcend, the adidas Ultra Boost ST and the New Balance Vongo are good harbingers of the evolving mindset change. Regardless of whether the midsole is DNA gel based or not, the Adrenaline GTS 16 does have a supportive ride as advertised. However, the part about ‘soft cushion’ is misleading, because the Adrenaline isn’t a soft shoe. Not at all. You can have only one of the two things. Either a shoe is soft, or it is firm and supportive. Does Brooks realize that soft and firm are antonyms? On the contrary, it rides very firm, and even more so than the outgoing Adrenaline GTS 15. The problem with calling the GTS soft is that it gets compared to a shoe like the Glycerin, which by the way does happen to be a soft shoe. Perhaps ‘cushioned’ could have been used in the context of the Adrenaline 14, but that shoe is ancient history now, buried in the deepest recesses of sites like ebay. What you have today is the GTS 16, which is a stiff riding shoe. Definitely not a bad thing, provided you know what you’re buying. But then why do brands insist on calling all their shoes plushly cushioned regardless of the fact that the midsole softness of their products ranges from pillow-ey soft to hardwood stiff? Shoes such as the Brooks Adrenaline and Saucony Guide exist for a reason. Not all runners want their shoes to feel like marshmallows; many prefer their running shoes to be firm riding, and the new GTS fits that role perfectly well. At a basic level, ‘stability’ shoes are of two kinds. The first type makes the medial (inner) side of the midsole much firmer than the lateral(outer) side, producing a distinct bias in which the foot feels like being pulled towards the softer side. The second type of ‘stability’ shoe intends to maintain a consistent firmness throughout the width of the midsole. This could be achieved with the use of a firmer medial post but keeping the rest of the midsole only marginally softer, or without (the Transcend 3). 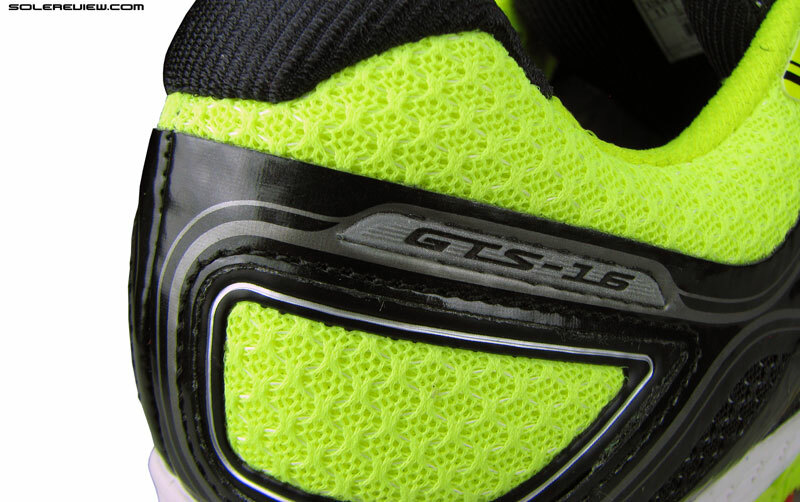 The GTS 16 might have a quad density midsole, but the final ride quality feels seamless. The Adrenaline GTS 16 belongs to the second category of support/stability shoes, where the ride feels more or less consistent instead of being lopsided towards the outer midsole. 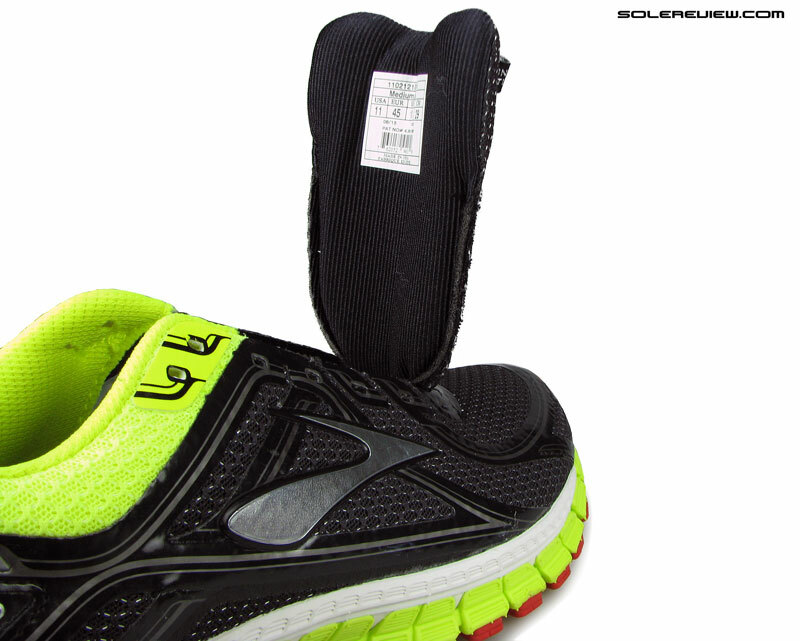 Though the GTS 16 has an ultra hard medial post (the grey portion), it is balanced by a very firm lateral side. So while you do feel that there’s something harder under the arch side of things, the spread of firmness is very gradual and subtle across the four-density midsole. Let’s examine how the GTS 16’s midsole is constructed. The usual buzz-phrase used to describe stability shoes has long been ‘dual density’, but the Adrenaline is actually quad-density. Meaning that there are four different kinds of foam packed into one midsole. In an era of all-out design minimalism, brands like Asics and Brooks still prefer a technical approach towards designing their shoes. From L to R: Softest (white) to firmest (grey). 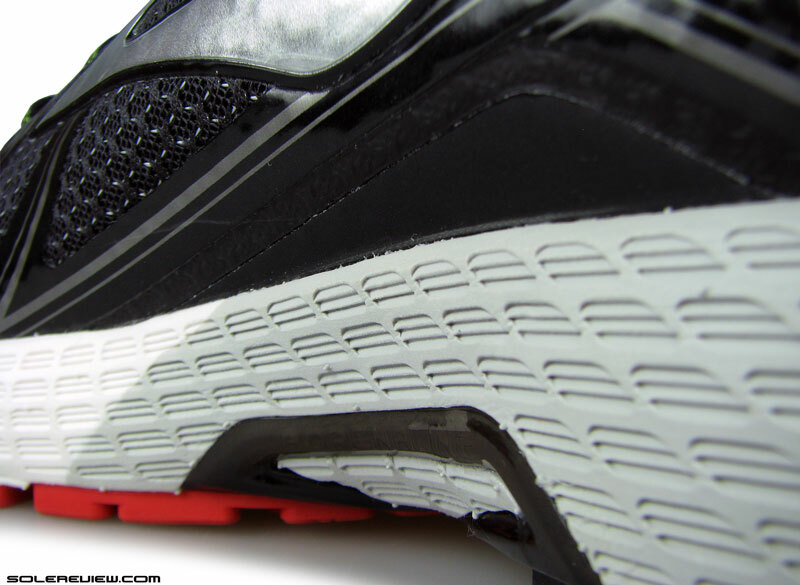 On the inner (medial) side of the midsole, there are three different foam densities. 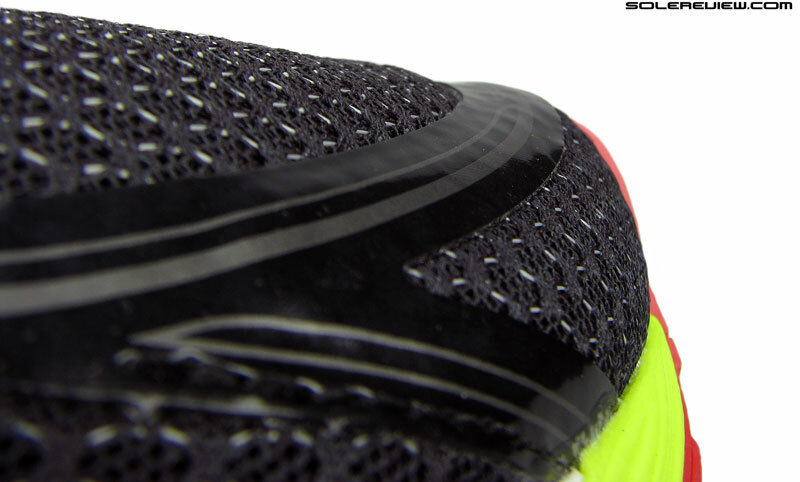 There’s a sliver of red running vertically near the heel edge, followed by the ubiquitous medial post. The forefoot is softer than the rear, the result of a white colored foam which is the least dense of all four foams. 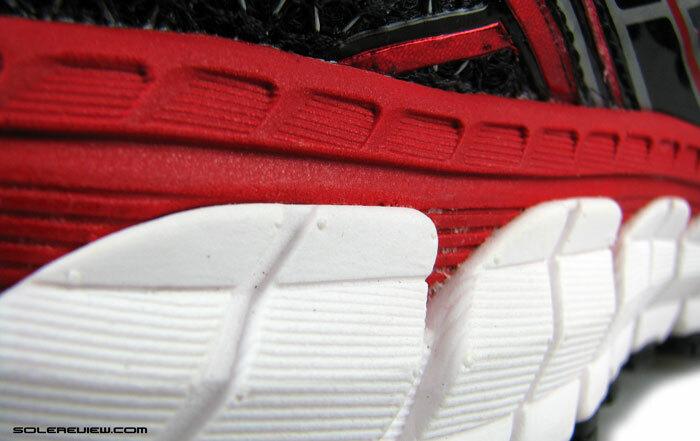 By the way, the red insert expands under the foot to a much larger piece of foam, bridging either sides of the midsole. 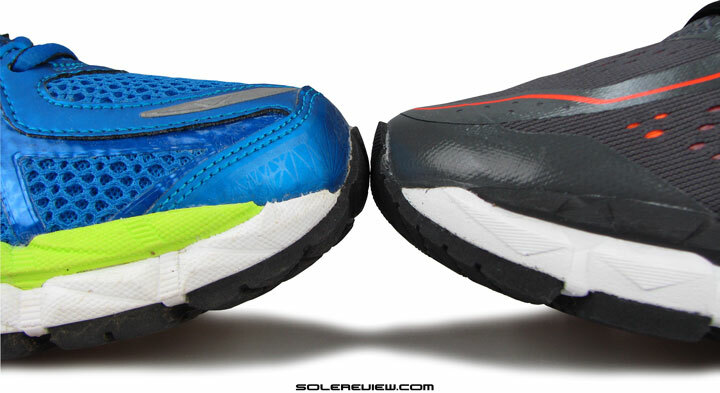 You can see that in the outsole comparison picture later in the review. The lateral (outer) side of the shoe only has two densities. 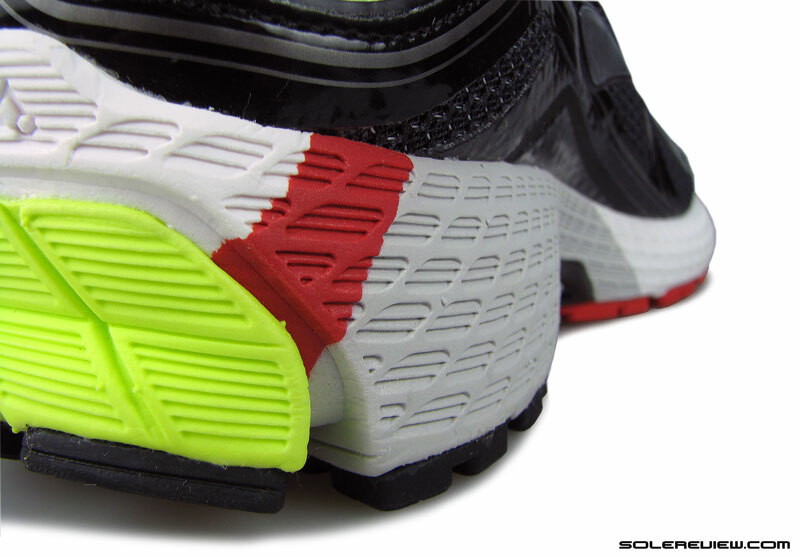 The outer (lateral) midsole is relatively uncomplicated. Just two densities of foam here; the top white layer, and the lime green colored piece which spans from heel to toe. When seen from the rear, the green section is crimped right down the center, and this might lead one to believe that it will compress a lot more than the medial post, which is firmer and without any grooving. But none of that sort happens. Regardless of the super firm medial post, the GTS 16 has a balanced ride character. 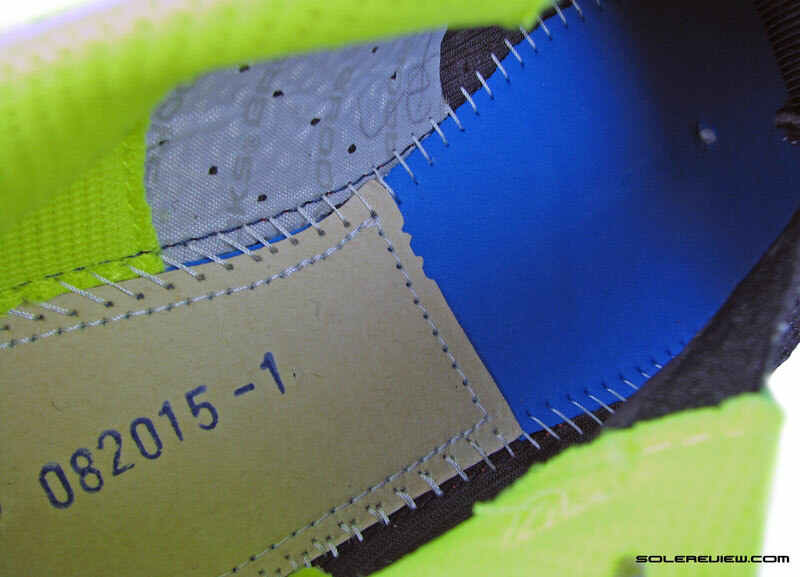 The lime green part of the midsole is quite firm, and does not pull the foot to one side. While you can definitely sense the difference in densities between either sides of the midsole, the Adrenaline GTS stays clear of leaning too much outwards. Mind you, there are shoes which do that (lean to one side). Like the Brooks Ravenna, or the New Balance 860 V5 and the Nike Structure 19. The design complexity of the GTS 16’s midsole notwithstanding, the final ride quality is very ordinary. It does not have the rebound quality of the adidas Sequence 8 Boost, nor the top-layer responsiveness of Saucony’s Everun topped Guide 9. 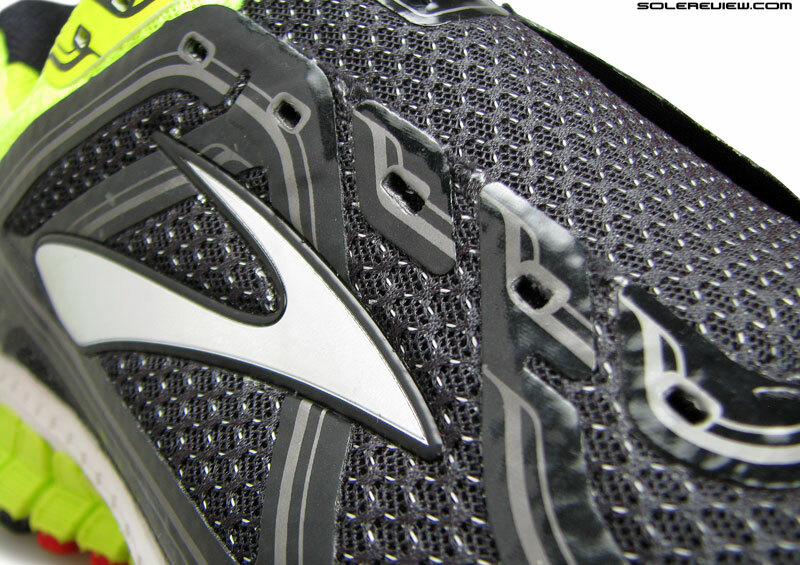 The insole is the only soft part of the GTS 16. Molded foam with a smooth texture. 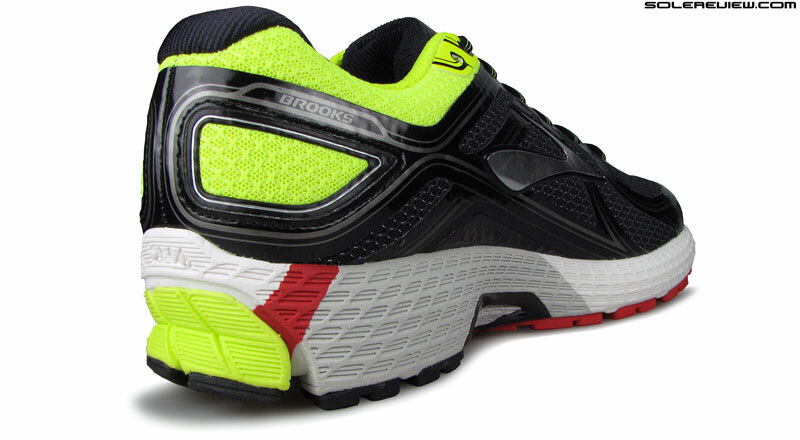 The insole is made of BioMogo foam, which Brooks claims to be landfill friendly. If the firm midsole wasn’t enough, the dual lasting (board+foam) under the heel and midfoot imparts a firm quality of ride. The GTS 16 is a firm, supportive shoe, and that’s the end of the story. 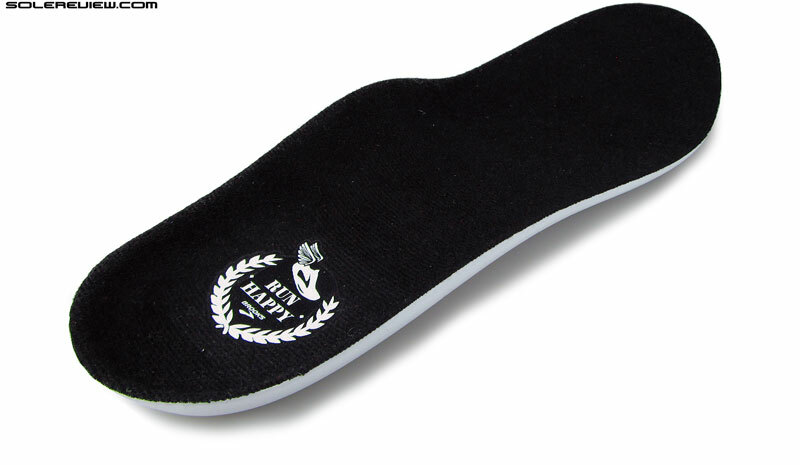 If there’s any cushioning felt, that’s only because of the removable foam insole, and nothing else. 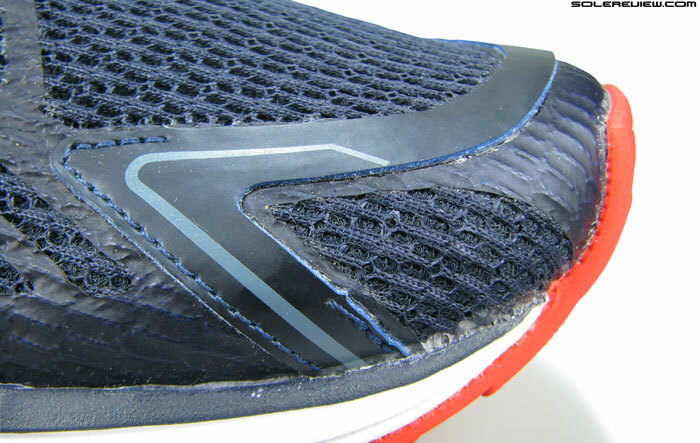 The half board lasting visible below the insole should be proof enough of the GTS 16’s ‘firm’ intentions. Like we said, the firmness isn’t an disadvantage at all, but just happens to be the nature of the GTS 16. And this, you can use to your own advantage. The supportive ride works perfectly for faster paced runs as compared to running in a mushier equivalent. It also works well in a dual-purpose environment like a weight training session, where you can use the Adrenaline for indoor running as well as training. The GTS is a heavy shoe though, by today’s standards. 349 gms/12.3 oz isn’t lead-weight heavy, but still a lot over what shoes weigh these days. So the moral of the story is: Buy the Adrenaline GTS 16 for its stable/supportive ride, and not for its cushioning. Stable is what the GTS 16 is supposed to be, and that’s what it does. Stay informed and be happy, that’s our motto. The ride is consistent, which is an achievement considering how many different pieces the midsole is assembled together with. But since all those pieces are interlocked nicely, and the midfoot area filled in underneath, the GTS manages to blend everything together in harmony. 1) Slightly firmer forefoot 2) Midfoot ride feels unchanged 3) Firmer midsole heel than the GTS 15. It is worth underscoring that the GTS 16 feels firmer to run in when compared to the GTS 15. We could think of only one reason why that is. 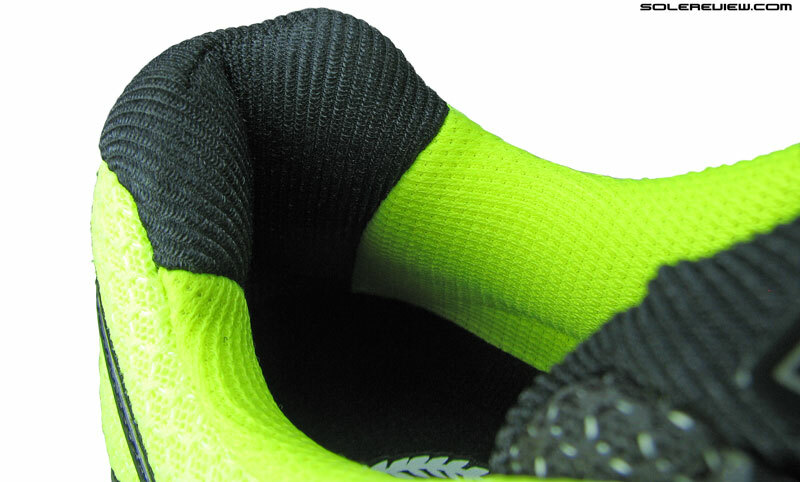 The GTS 15’s lateral side midsole foam was slightly softer than the lime green piece of the 16. While the difference is marginal, perceptive runners will be able to point out the difference when transitioning from the 15. Perhaps that explains why the GTS 16 is 5 gm/0.2 oz heavier than the 15? 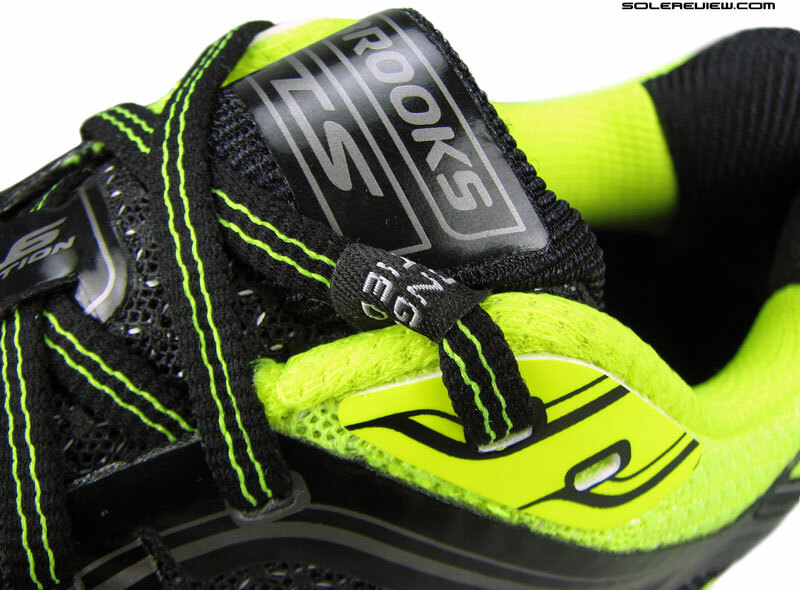 Brooks running shoes have always gripped very well, thanks to the blown rubber design. That’s the standard layout in many recent shoes; a softer rubber lines the front underside while a more durable compound covers the rear. This set-up is susceptible to faster wear and tear, and that has been true for many past and present Brooks models. Realistically, one should expect no more than 450 miles out of a Brooks running shoe. Anything over that is a bonus. Brooks loves their cosmetic detailing. Notice the text ‘Adrenaline’ under the plastic shank? What Brooks lacks in ride quality, it makes up in the detailing department. Brooks designer and developers must love their elements of detail, which makes most Brooks shoes come across as a labor of love than a plain jane industrial product. We mean, look at the plastic shank. Underneath the dark plastic is the text ‘Adrenaline’ faintly visible. Only a small percentage of people who buy this shoe will ever see it, but they still decided to put it in. The outsole too; there are snippets of molded texts like ‘sixteenth edition’, ‘blown rubber’ and ‘Flextra’ in between the lug spaces. You can fault Brooks for everything else, but not for their attention to cosmetic detail and having a bit of fun in the process. That approach applies to the upper too, though this year things have been toned down a bit. The design looks familiar, but there’s a reduction in synthetic layering this year. The midfoot and eyestay section has been cleaned up, visually speaking. 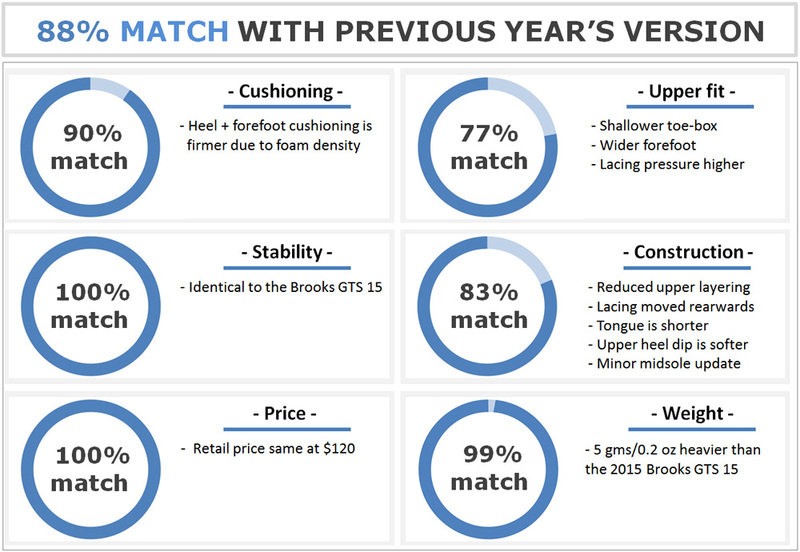 Brooks has replaced most of the stitched components on the outgoing GTS 15’s upper with fused-on synthetic. There’s a reduction in the number of components too; for example, the toe-bumper is no longer smothered with stitched-on synthetic. 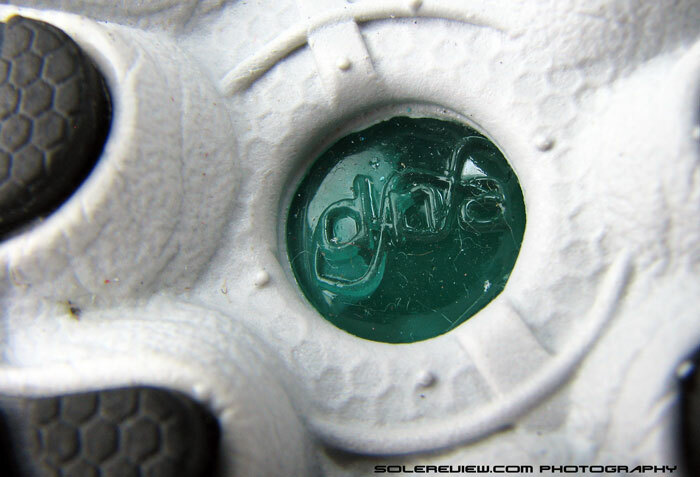 The same goes for the midfoot panel and the lacing eye-stay too. Collar lining? Same as last year, just a bit softer – we’ll explain in a bit. 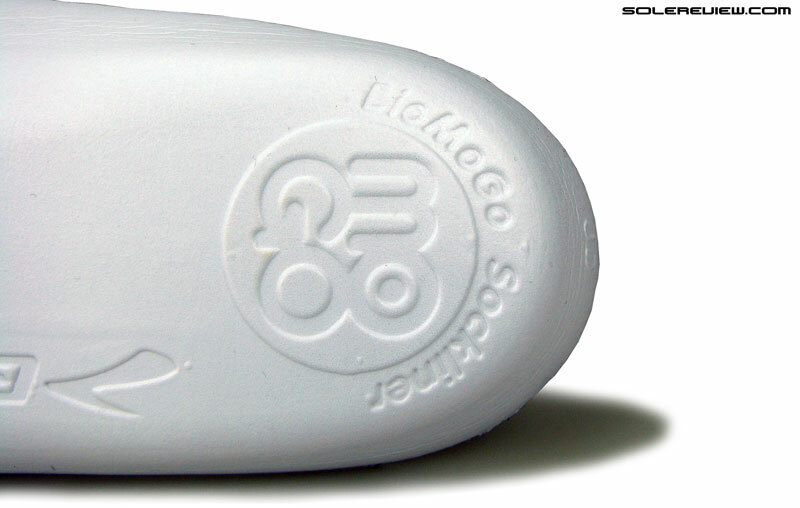 Tongue padding is identical to the GTS 15, and so is the base design. It does not have a sleeve. 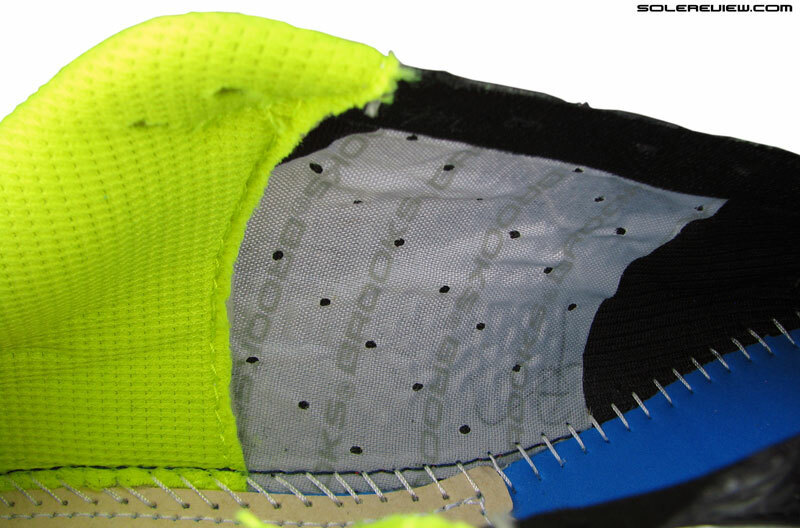 Brooks remedies the GTS’s sleeve problem by adding an extra lace-loop which locks the tongue in place. This has long been a Brooks-only trick. There’s a reflective trim on the outer heel, and another one on the forefoot. The heel collar lining has been borrowed without change from the GTS 15, and the tongue lining and padding fill is very similar too. Other areas of detail like reflective trims have been readjusted a bit, like moving toe-tip reflectivity to the lacing area. The tongue is a free agent without any sleeve, but Brooks’s cheeky ‘tongue-tied’ loop prevents any sliding. However, beneath the familiar veneer lies a few structural changes, ones which affects the GTS 16’s upper fit to a certain extent. The front is always a good place to start, and when you do, you’ll see that the toe-box is way slope-y than the GTS 15. 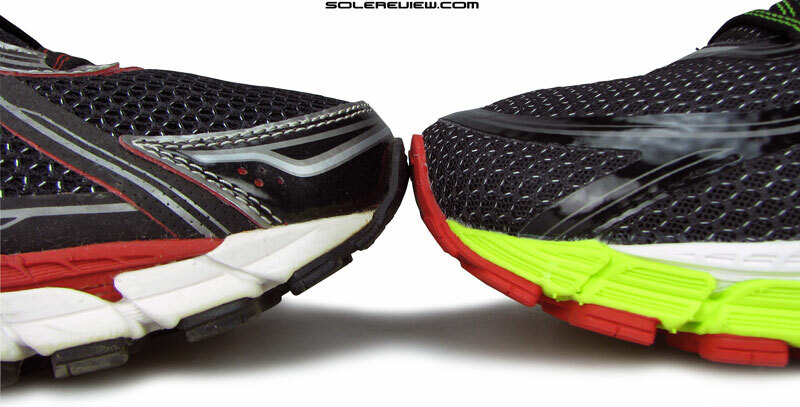 The GTS 15 (left) has a much higher toe-box than the shallow GTS 16 (right). This silly synthetic band also cramps toe-box height. Ok, here you go, both the Adrenaline versions lined up tip-to-tip. 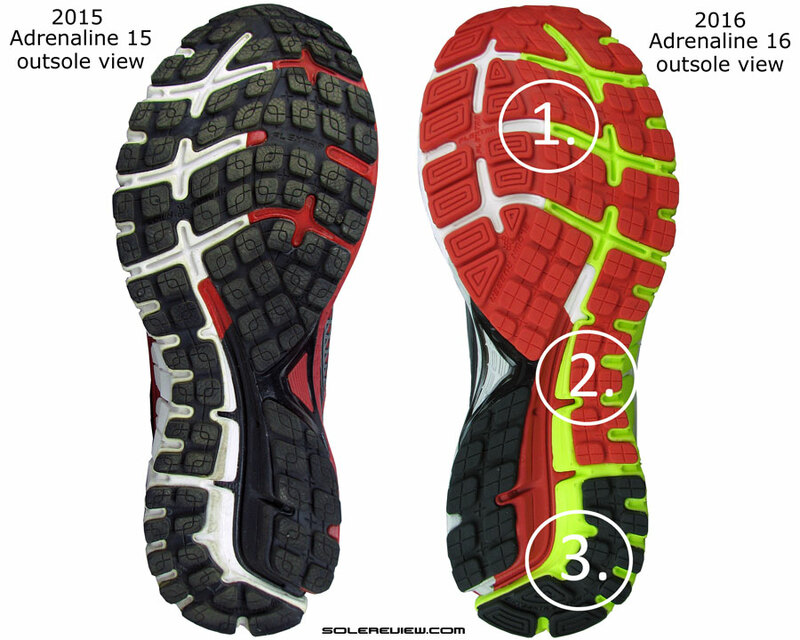 The 2015 GTS 15’s synthetic toe-bumper design produced more margin above the toes compared to the current version. The GTS 16 also has this strip of synthetic arching over the toe-box, a design feature which we saw on the Ravenna 6. The midfoot is lined with a woven material, but only on the inner/medial side. Perhaps to avoid any arch irritation? Whatever the reason, this is a thoughtful touch. 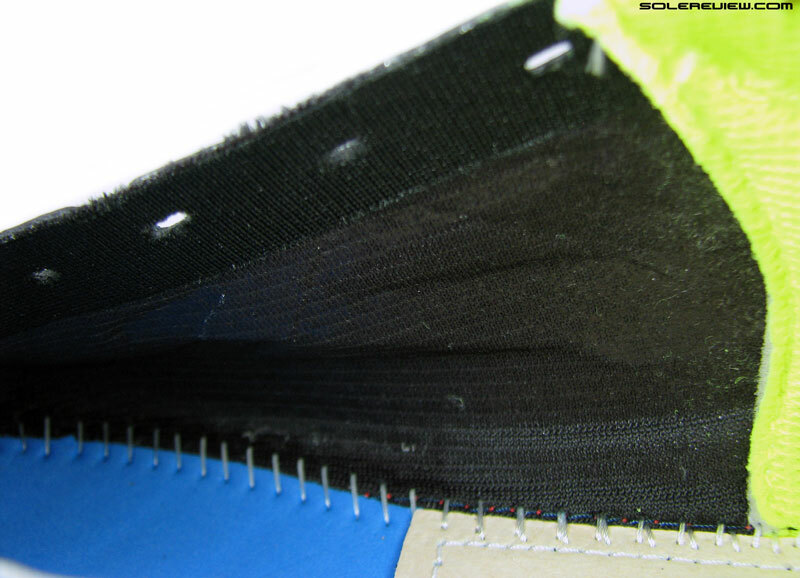 No such lining exists on the lateral side of the shoe’s interior. The lacing area is moved further away from the toe-tip relative to the GTS 15, thus creating a larger portion of the forefoot unrestricted by the lacing cinch. The lace-loop design has been updated too; the GTS 16 replaces the twin fabric speed loops with regular punched-in eyelet holes. While they were it, the midfoot panels have been thinned down as well. The GTS 16’s tongue is shorter than the GTS 15’s. 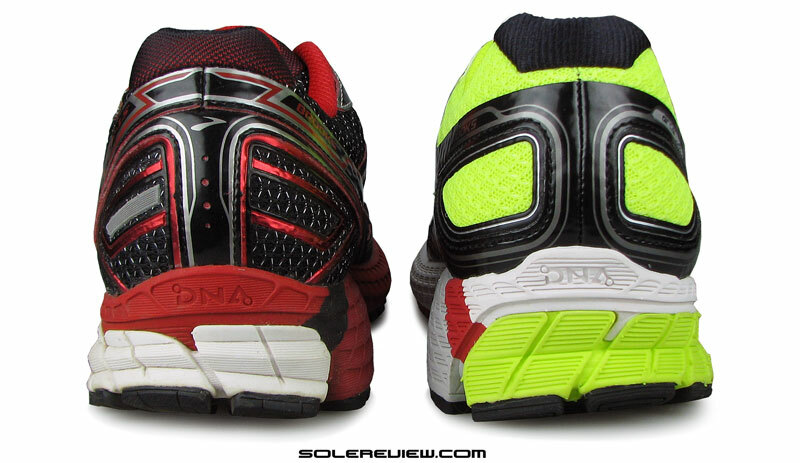 On the GTS 16 (right), the synthetic is positioned lower than the GTS 15 (left), making the upper Achilles part softer. Near the heel collar area, the tongue ends up shorter over the foot, and the Achilles dip has been softened with a wider opening. 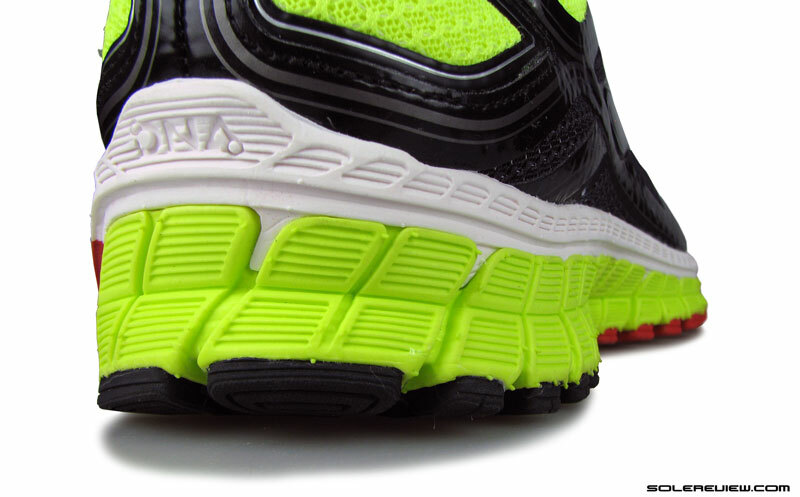 On the GTS 15, the synthetic layering reached out higher and made the top slightly stiff. On the GTS 16, the synthetic overlays have been re-positioned downwards – hence allowing more mesh and foam near the heel top. 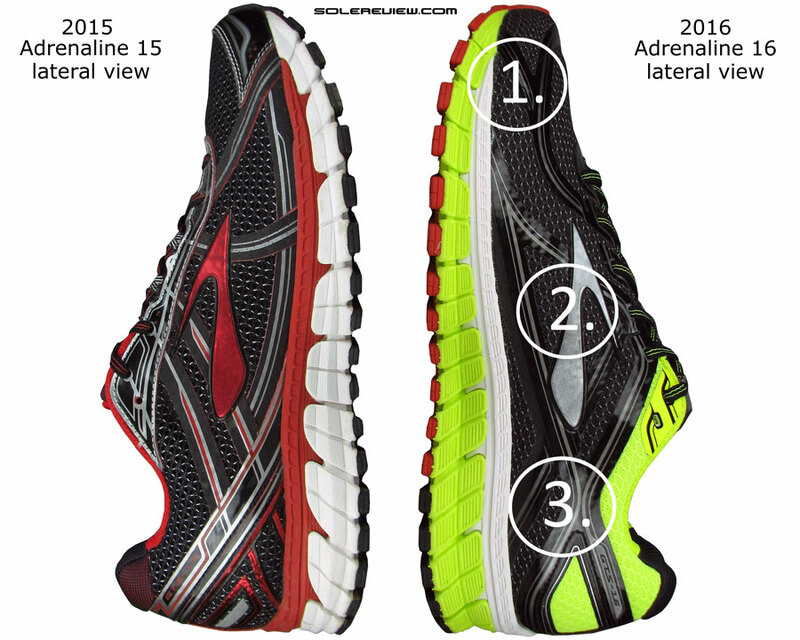 Consequently, the GTS 16’s Achilles area feels softer on the foot than the GTS 15 did. The changes made to the forefoot lead to a mixed result. While the forefoot definitely feels wider – moving the lacing and getting rid of synthetic on the sides does it – but the toe-box is much shallower than the GTS 15. The slightly relaxed heel also opens a little more space ahead, but the sheer shallowness of the GTS 16’s ceiling eats into whatever gains the heel might have made. While the strip over the toe-box isn’t as bad as the one on Ravenna 6, it is symptomatic of design blindness. Why put something in which looks cool, but serves no other functional purpose? A shallow ceiling is also prone to faster wear and tear too as it increases the possibly of the toe rubbing against the mesh. Other examples of design blindness are plentiful; like the Asics Kayano’s shallow toe-box and adidas Energy Boost’s plastic cage, to name a couple. Another thing which needs a mention is that the smooth synthetic band used on the GTS 16 bends and presses inwards on the foot. While the forefoot eventually breaks in after a few runs, the band on the outer midfoot (near the midsole edge) remained a minor irritant at the time of writing this review. Super weird, right, for a panel located near the midfoot edge to bend inwards, isn’t it? The midfoot grip isn’t as intense as the GTS 15, and that’s because of the toned-down lacing eyelets (no speed loops) and a thinner midfoot panel. 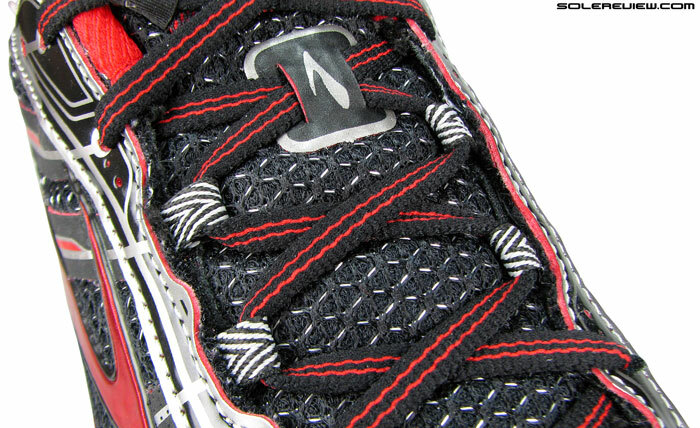 However, the laces applies more pressure near the tongue flap than the GTS 15; and this is due to the shorter tongue. Since there’s more material over the tongue near its flap – larger synthetic box, turned over seam and all that jazz – the lacing makes it even more crowded. So there’s this distinct sensation of excess material over the foot, something which was absent on the Adrenaline GTS 15. So as far as the overall quality of upper fit is concerned, we’re partial towards the last year’s Adrenaline GTS 15 – regardless of its snug forefoot fit. The GTS 15’s fit had a consistency which is missing on the GTS 16. The latest GTS 16 has its hot spots, like the shallow toe-box and the lacing pressure over the tongue flap. One could have always remedied the tightness of the GTS 15 by going a half-size up or sideways. But when a shoe’s shallow at the front, the sizing’s ability to make a difference is somewhat handicapped. For everything else, the Adrenaline GTS 16 delivers on its promise. 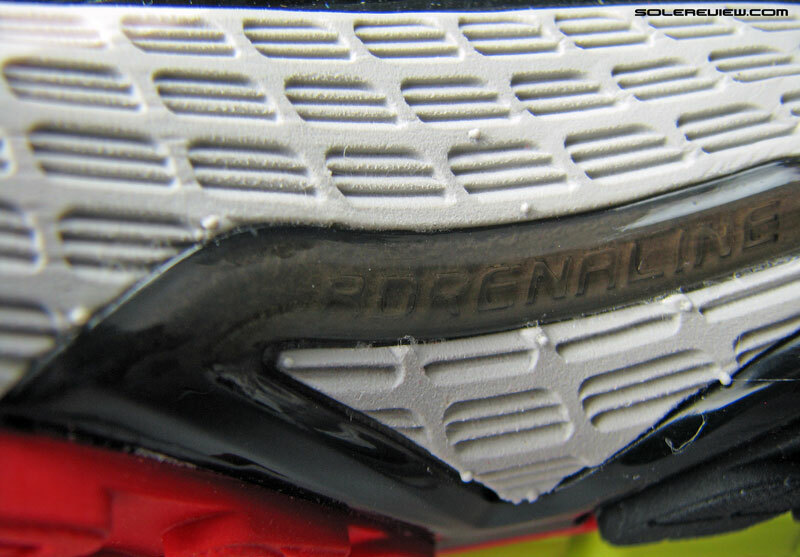 The midsole is supportive, displaying none of the ride upsetting traits which some stability shoes tend to possess. 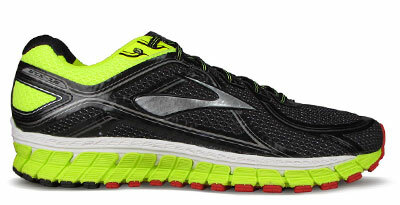 The entire shoe has been redesigned from ground up – new upper, new sole, as has been the way of the Brooks brand. But is new the same thing as improved? That is the question, really. 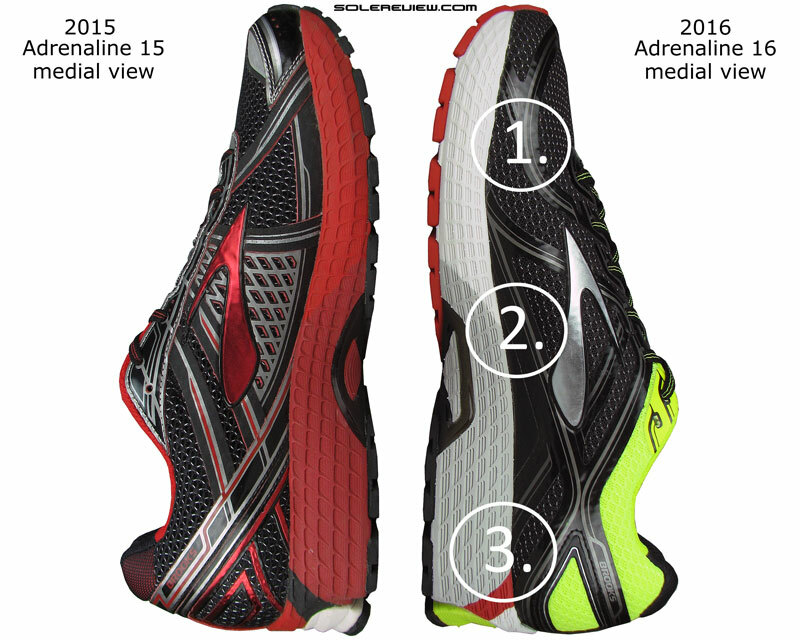 And if you ask solereview, we’d say save some money by grabbing what’s left of the 2015 Adrenaline GTS 15. 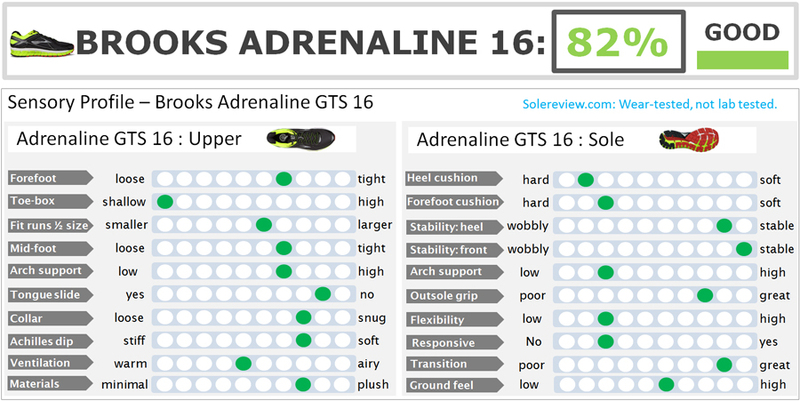 Looking to upgrade your old Adrenaline GTS 15 to the latest version, but not sure how the 2016 model compares? We can help here. The following infographic is a ready-reckoner for what changes you might expect in the new model vs. old. To make this more fun, we’ve put in a system of percentage match, which calculates a weighted average for a set of attributes.